CREATIVE LIBRARY is an additional module of the Intelligent DAM Platform that allows you to streamline the work of content authors and publishers thanks to the ability to edit THRON content using local software and keeping the cloud archive always synchronized with the latest version. 1. I have to maintain a constantly updated archive of all files. 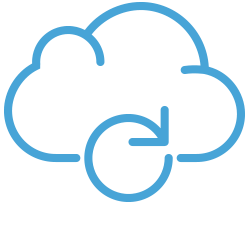 Creates a cloud backup for all files in your organization. 2. My colleagues work with desktop solutions. Automatically synchronizes the latest version of the file in the cloud while continuing to work in your software. 3. Uploading and downloading files takes a long time. You can interrupt the uploading/downloading process and resume at any time. Simplified uploading of entire branches of folders and related content to replicate your storage automatically in the cloud. Integration with all desktop tools like Office or Adobe Suite to always work on the latest version of the file. Automatic updating of files every time you save, to make the updated version available in the cloud. Stop and resume the uploading/downloading of large files at any time.